Montrose Education Foundation awards $10,000 Impact Award to Chris Thompson from Centennial Middle School for the “Fantastic Plastic” Project! 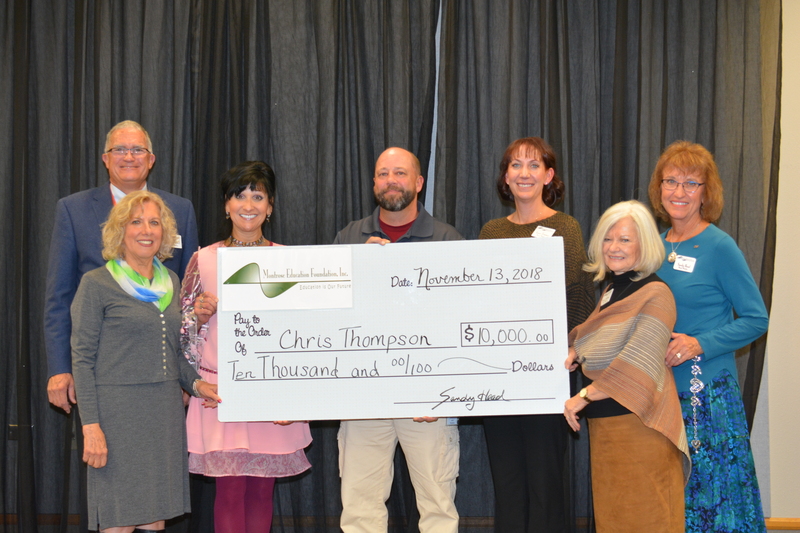 (Montrose) At today’s American Education Week reception at the Montrose Pavilion, the Montrose Education Foundation (MEF) awarded its annual Impact Award and a $10,000 check to Chris Thompson from Centennial Middle School for the “Fantastic Plastic” Project. MEF created the Impact Award in 2011 to support innovative projects that enhance educational opportunities in the Montrose and Olathe School District. Under the award guidelines, only recipients of the MEF Teacher of the Year Award can apply. The “Fantastic Plastic” Project is a 3D filament and cafeteria plastic recycling program. It is a pioneer program to offer a student-designed and driven 3D print recycle program for all district schools and facilities that use 3D printing technology. It will include the development of a manufacturing process to recycle plastic bottles and cafeteria containers as well as the waste from 3D printers into usable recycled filament for the districts 3D printers. The project will begin in the district and then be expanded to offer recycling services to area businesses and hobbyists. Formed in 1985 the Montrose Education Foundation supports the Montrose and Olathe School District to meet the learning needs of students and to celebrate and recognize the contributions of local educators. Learn more at www.montroseeducation.org.